The Southern Living 2014 Annual cookbook has a recipe for Cream of Mushroom Soup which can be used instead of the red and white can we are all so familiar with. It needs to be kept frozen and thawed to use. 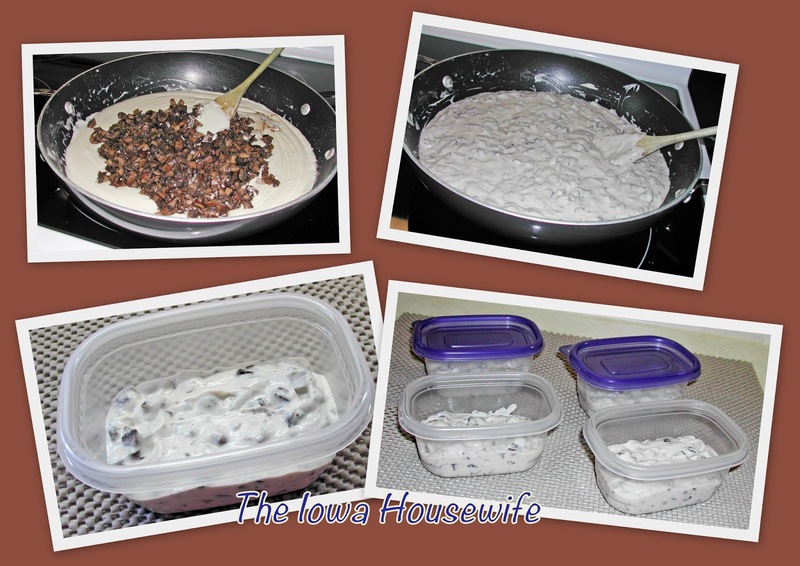 There is flour in the recipe and of course it is thick so it can not be canned. After reading the recipe I decided to try it. It is easy to do, has no preservatives, and with cream, butter, cream cheese and mushrooms how could you go wrong. It does use the concentrated chicken stock in the tubs or sticks. I use Knorr Brand because we like the flavor. Do not use liquid stock or it will dilute the soup too much. My Grandson and Bettie liked it made into soup, use like the can and add a equal amount of milk and heat. You can use this in any recipe calling for condensed cream of mushroom soup. 1 and ¼ cups is equal to each can called for in your recipe. I froze ours in 5 ounce amounts (by weight) to equal a ½ can as we like to make a smaller amount of most casseroles. You can always thaw two or more as needed. We like it so well that I am going to see if I can make a version of cream of celery. Clean and chop mushrooms. Melt 3 tablespoons butter in a dutch oven over medium-high heat; add chopped mushrooms and sauté 10 to 12 minutes until most of the liquid is evaporated. Transfer to a bowl. Lower heat to medium. Melt remaining butter in dutch oven you used for mushrooms. Whisk in flour until smooth; whisk one minute more. Gradually whisk in cream and than cream cheese and concentrated chicken stock. Cook, whisking constantly, 2 minutes or until melted and smooth. Remove from heat and stir in cooked mushrooms. Use immediately, or cool completely. 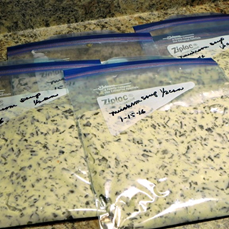 Freeze in 1 ¼ cup portions in plastic freezer bags or containers. Thaw before using. To use for soup add an equal amount of milk and heat. Use in any hot dish the same as any condensed soup called for. Myrna, This is genius. I really hate using canned creamed soups for recipes. Now I won't have to. Thanks.